This week I’m jetting off to a place where sleep doesn’t exist and cocktails are acceptable at any time of the day… can you guess? Buttery biscuit base. 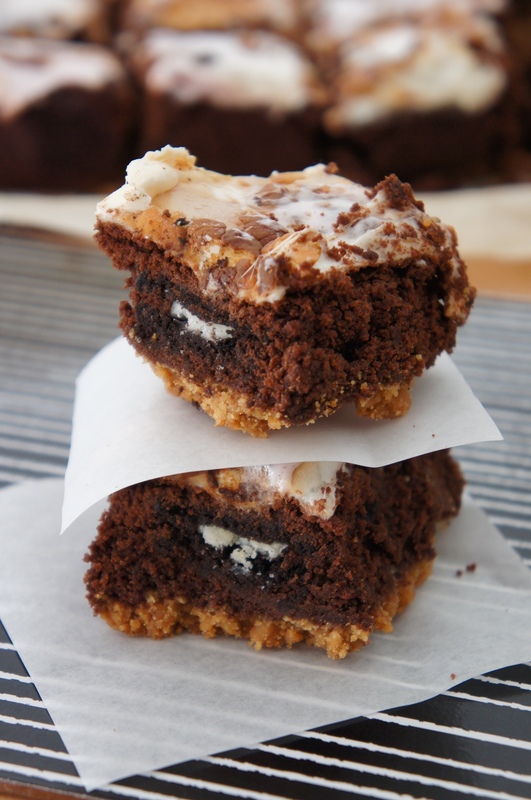 Gooey brownie. Oreo’s. 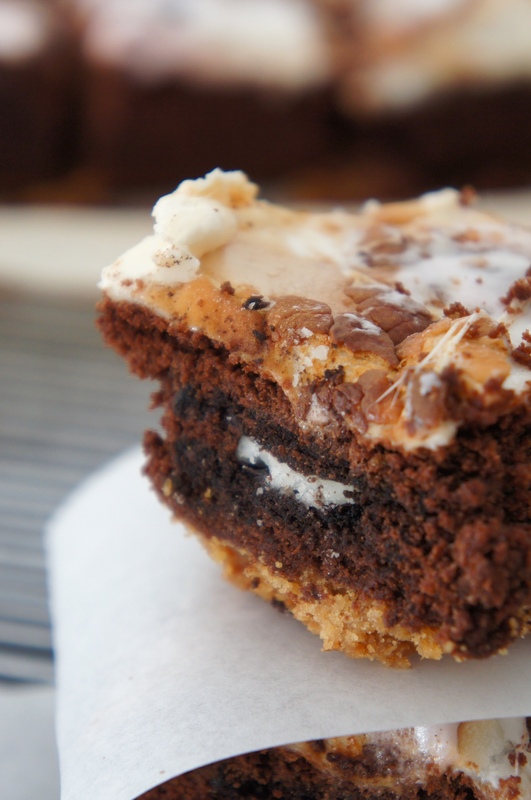 More gooey brownie. Melted marshmallow. 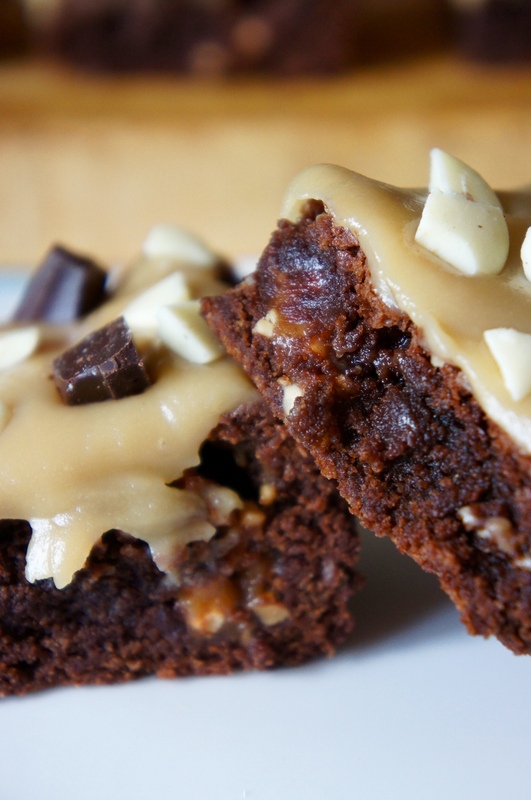 Oh my goodness these brownies should come with a health warning, but for all the right reasons! 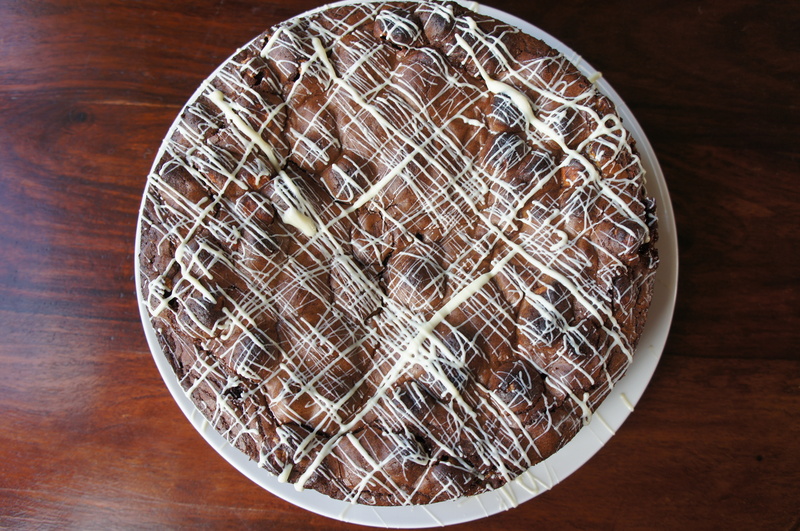 Line a 23cm x 23cm square baking tin with greaseproof paper. Put the biscuits in a bowl/sandwich bag and bash with a rolling pin until completely crushed and free from any lumps. 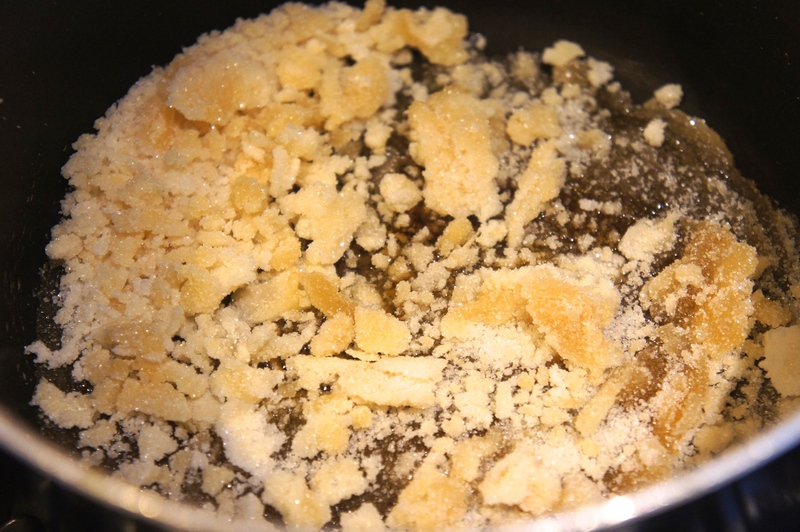 Now melt the butter in a separate bowl set over a pan of simmering water until completely smooth. Pour the biscuits into the melted butter and mix together. Spoon the mixture into the tin and press with the back of a spoon to form an even layer. Refrigerate. Preheat the oven to 180°C. 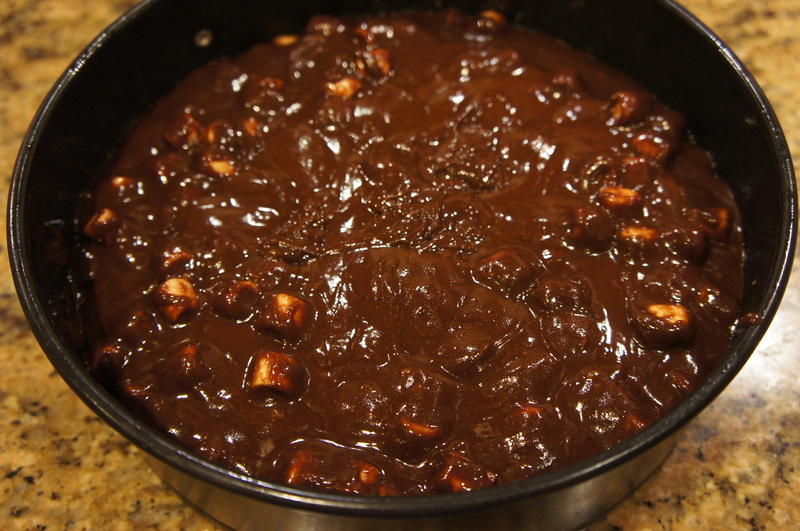 Melt the butter and chocolate in a bowl set over a pan of simmering water. Once melted leave on the side to cool. Meanwhile, whisk together the sugar and eggs in a separate bowl until frothy. Now add in the cooled chocolate mixture and the flour and stir until you have a thick chocolate mixture. Take the base out of the fridge and pour 1/2 of the brownie mixture over the top of the biscuit base, spreading it out into an even layer. 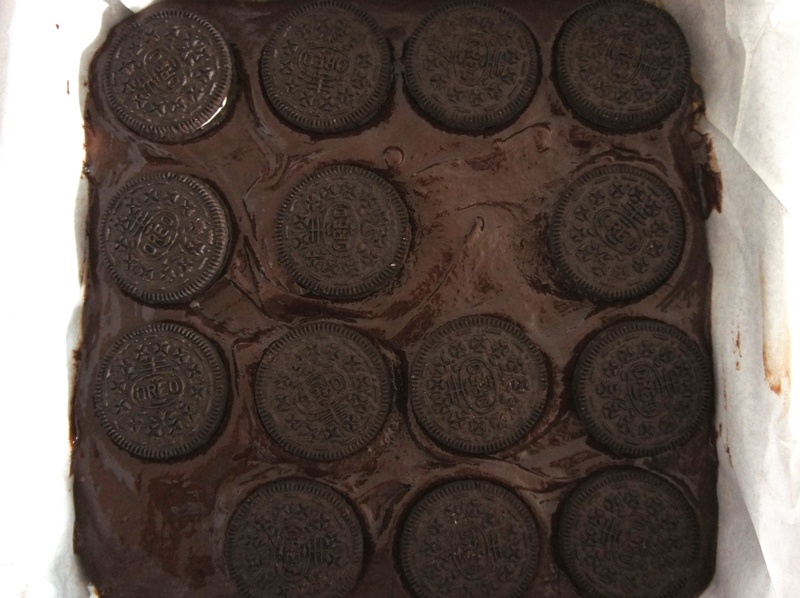 Place the Oreo’s on top of the layer pressing them into the mixture. Now dollop spoonfuls of the remaining brownie mixture on top, spread it out into an even layer so that all of the Oreo’s are concealed. 4. Bake in the oven for 20-25 minutes, until the top has formed a crust and the edges have started to crack. (My testing method for perfectly cooked brownies: insert a toothpick into the one of the edges, it should come out clean. Now insert a toothpick into the middle, it should come out slightly covered in mixture). Turn of the oven and pre-heat the grill. Layer marshmallow’s across the top. 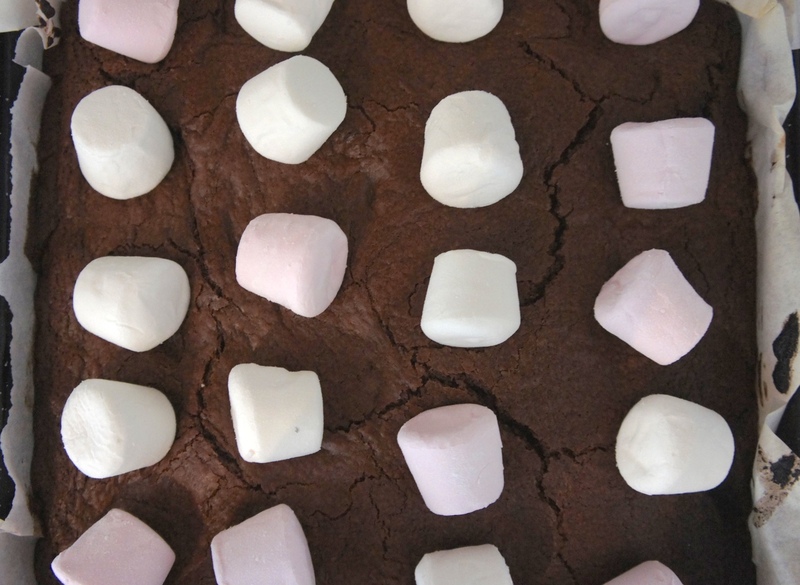 Put the brownies under the grill for a few minutes until the marshmallows have melted and are golden. Keep a close eye on them as they can burn very easily! Leave to cool completely before removing from the tin and cutting into 16 brownies. Lately I’ve been obsessing over Snickers. Peanuts, caramel, chocolate and nougat. Seriously what is there not to love? 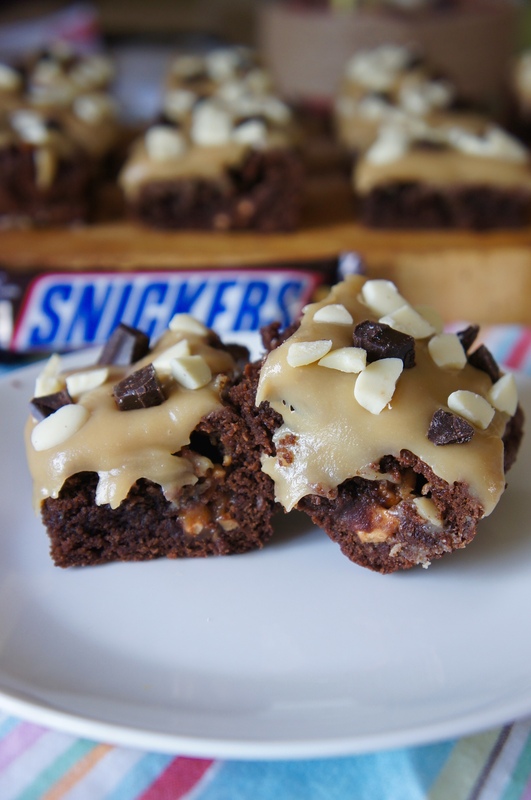 After the success of my Caramel Snicker Brownies, I started to think about other ways I could use Snickers in bakes. The result? 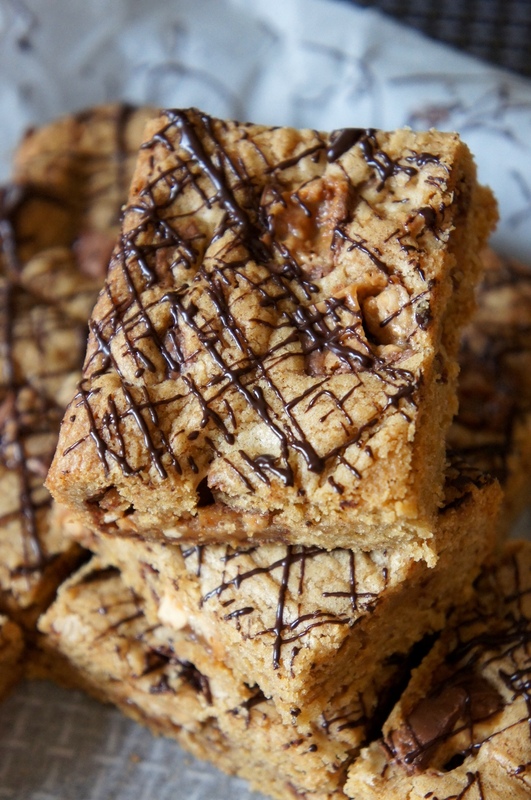 Peanut Butter Snickers Bar Blondies! Soft and chewy peanut butter blondies stuffed with gooey melted Snickers bar chunks and drizzled with melted chocolate. Absolute heaven! Preheat oven to 170°C and line a 20cm square baking tray with greaseproof paper. In a large, microwave-safe bowl melt the butter in 20 second blasts on high power. Leave to cool for a couple of minutes. 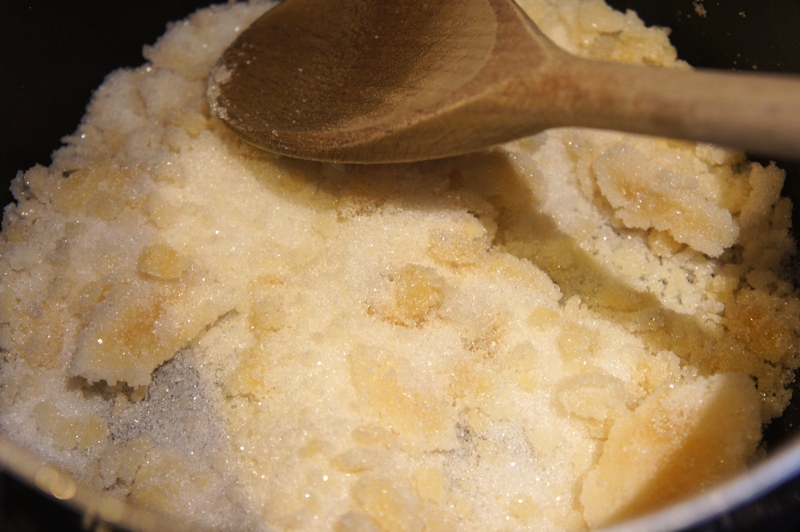 Sieve the sugars into a separate bowl and pour in the melted butter, use a wooden spoon to combine the ingredients until smooth. Add the eggs, vanilla extract and peanut butter and mix together. Add the flour and fold the mixture together, be careful not to over mix at this point. 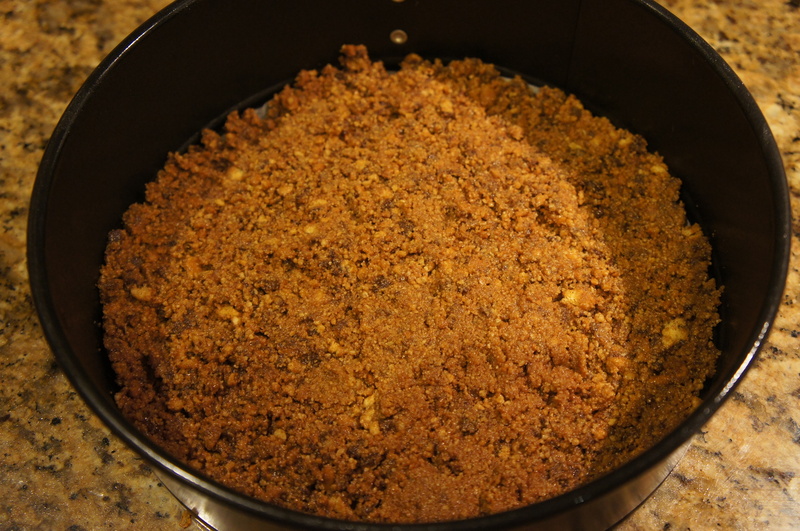 Finally, fold in 2/3 of the Snickers chunks before transferring the mixture to your prepared baking tray. The mixture will be very thick so try to spread it out into an even layer, pushing it into the side, as best as possible. Press the remaining Snickers chunks into the top. Bake in the centre of the oven for 20 minutes, until the edges are just starting to crack and are firm to the touch. Remove from the oven and leave to completely cool. 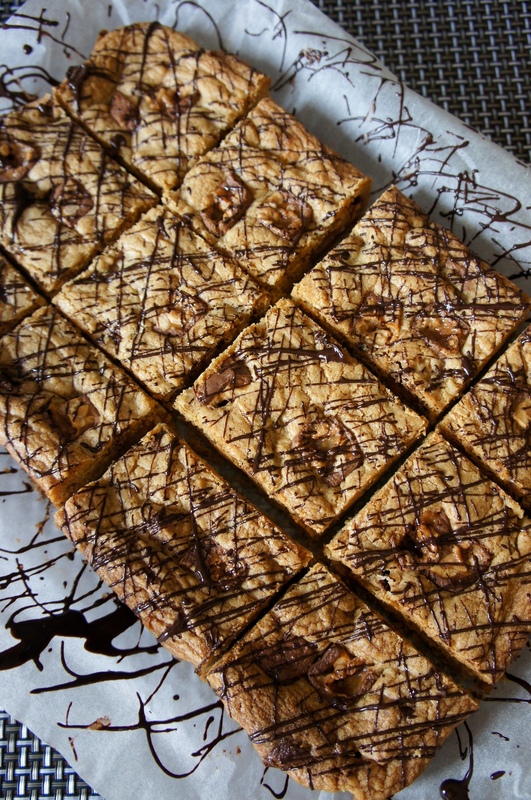 Once the blondies have cooled, melt the squares of chocolate in the microwave and drizzle it over the top of the blondies. Cut into 12 and serve. 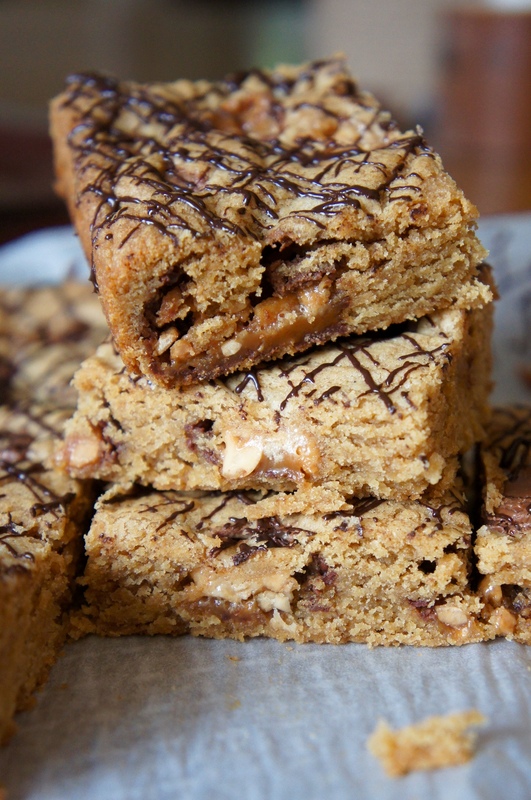 Blondies will keep in an airtight container at room temperature for up to 1 week, or in the freezer for up to 6 months. 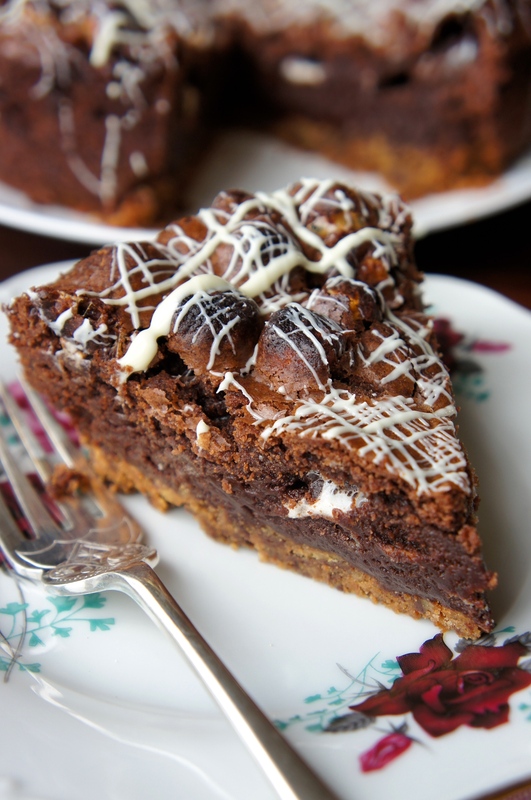 Well I have a show stopping alternative, perfect for any celebration… A Smore’s Brownie Pie! 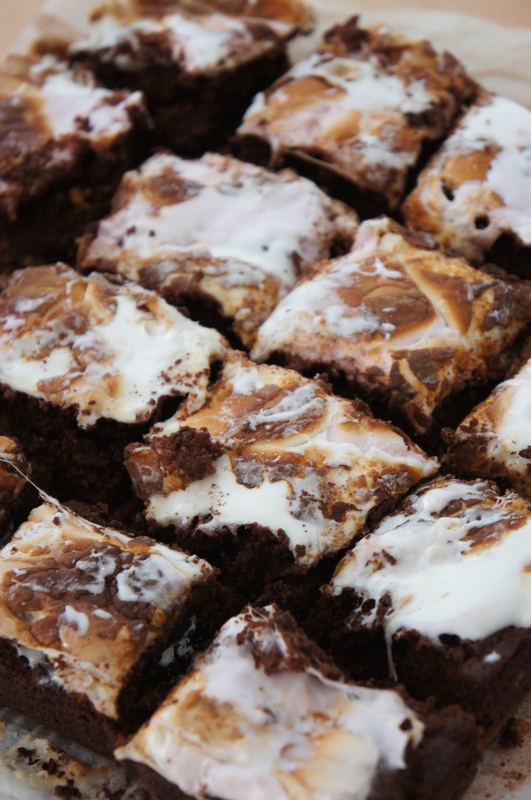 Crumbly biscuit base, topped with gooey marshmallow filled brownie mixture and finished with a drizzle of white chocolate. 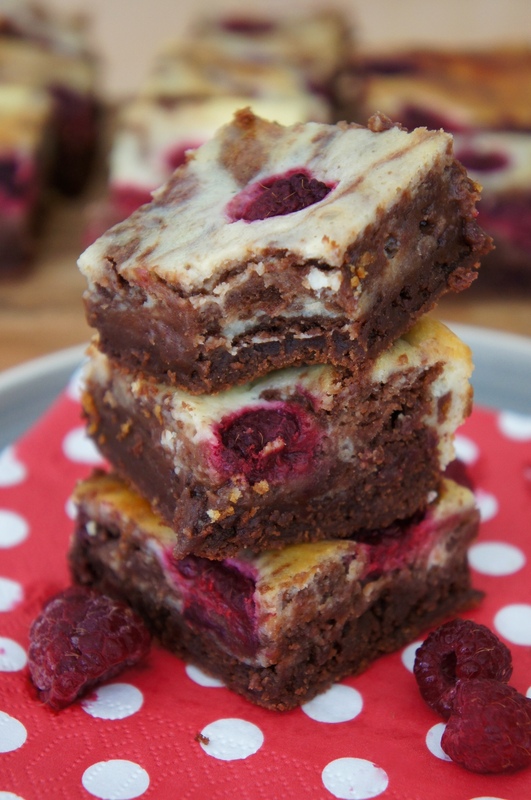 If you’re fan of rich, indulgent and damn right naughty desserts then this is the bake for you. And fear not, it’s actually pretty easy to make. You can use shop bought biscuits for the base, just bash them up and add butter, and shop bought marshmallows because let’s be honest who has time to tackle that!? 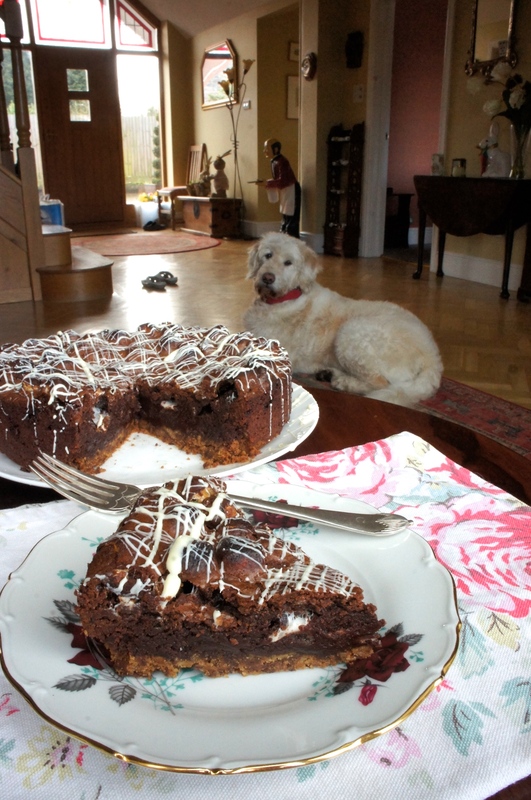 The brownie centre is of course my own tried and tested (and tried again!) recipe, but its a doddle I promise. The key to this bake is all in the cooking time, you want to make sure the brownies are just done but that the top isn’t burnt in the process. So I’ve suggested checking after 20 mins and if this is the case, covering the pie with foil to protect the top, see the recipe below for more details. Line a 8inch springform round baking tin with greaseproof paper. To make the base, first put the biscuits in a bowl and bash with a rolling pin until completely brushed. Now melt the butter in a separate bowl in the microwave for 10 second blasts. Pour the biscuits into the melted butter and mix together. Spoon the mixture into the tin and press with the back of a spoon to form an even layer. Refrigerate. Preheat the oven to 180°C. Whilst the base chills, make your brownie mixture by first melting the butter and chocolate in a bowl set over a pan of water on a low heat. Once melted leave on the side to cool. In a separate bowl whisk together the sugar and eggs until frothy. Now add in the cooled chocolate mixture and the flour and stir until you have a thick chocolate mixture. 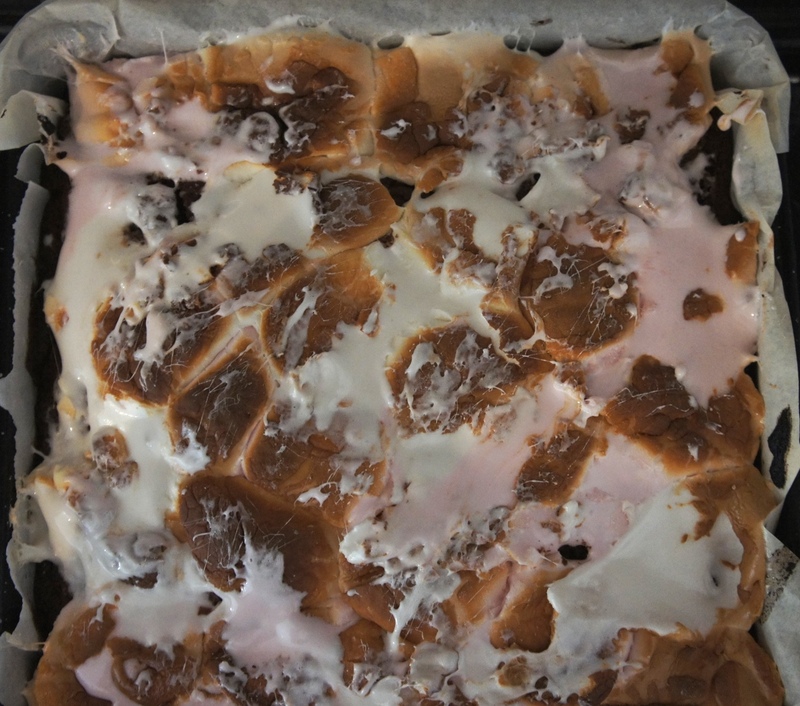 Finally, fold in the marshmallows. Take your tin out of the fridge and pour the brownie mixture over the top of the biscuit base, spreading it out into an even layer. Bake in the oven for 25-30 minutes* until the top has formed a crust and has started to crack. 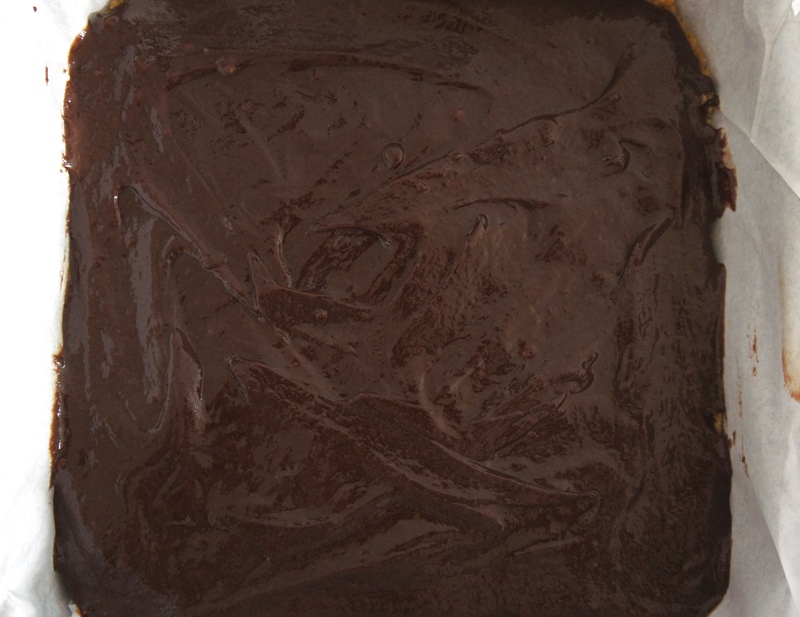 (Test the brownies by inserting a knife into the one of the edges, if it comes out clean the brownies are done.) 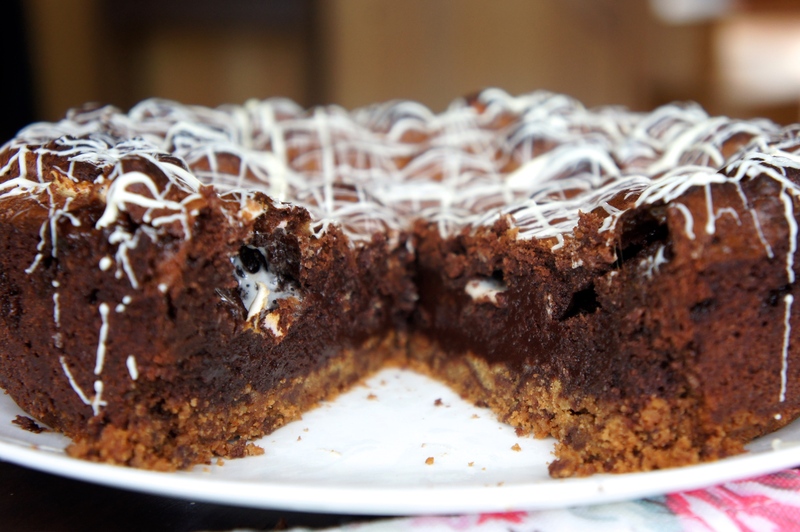 Leave the brownie pie to completely cool before removing from the tin. To decorate, melt the white chocolate in the microwave in 10 second blasts until smooth. 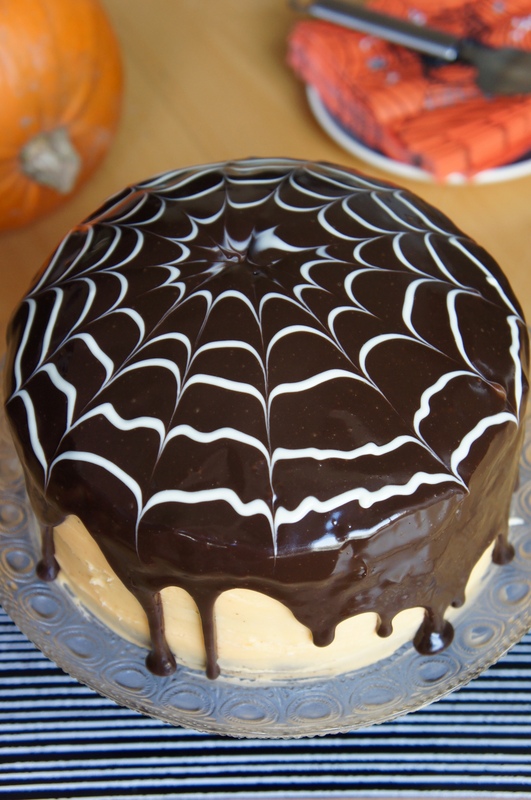 Use a spoon to drizzle over the chocolate in a crisscross pattern. Slice into 8 and serve – try it warmed with ice-cream! *check the brownie pie after 20 mins, if it’s starting to burn cover the tin with tinfoil, shiny side up, for the remaining cooking time. 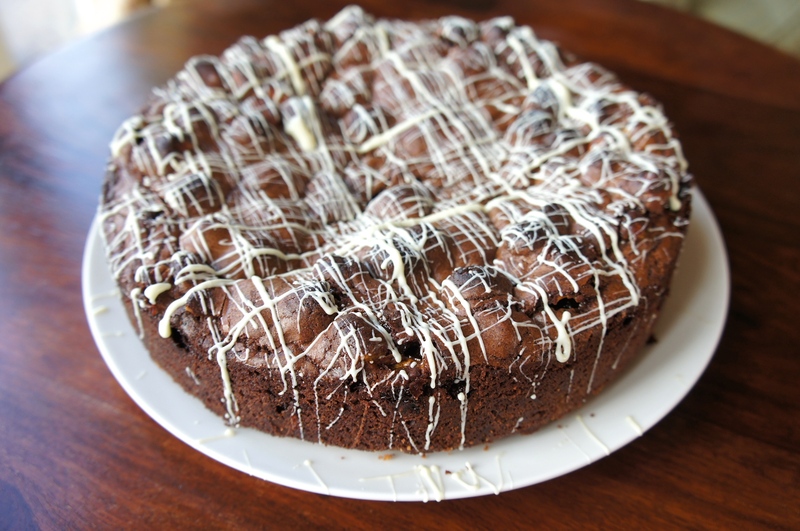 Gooey, rich, fudgy, salty, sweet and seriously indulgent. I made these brownies as a dessert for a dinner party and served them warm, with a dollop of vanilla ice cream and an extra drizzle of salted caramel. 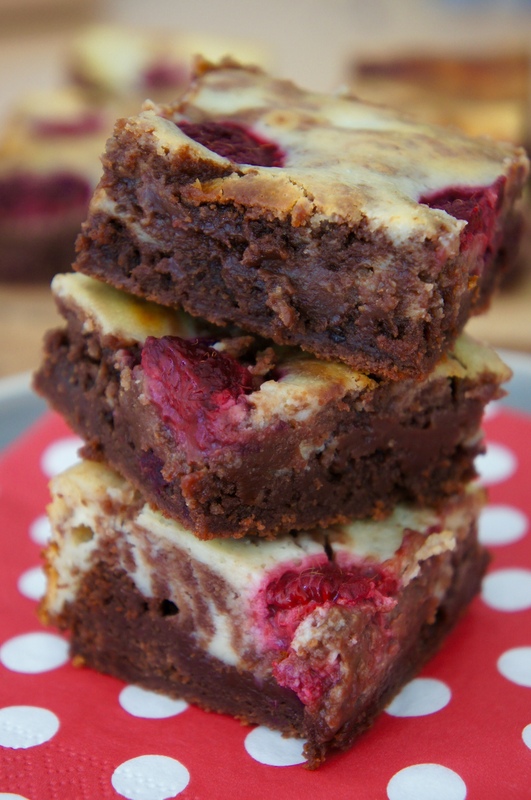 One bite of these and you are in brownie heaven! To make the salted caramel, heat the sugar on medium-high heat in a medium saucapan for about 5-10 minutes, occasionally stirring the pan in a circular motion using your hand. At first the sugar will be lumpy, but will soon melt and start turning a brownish color. 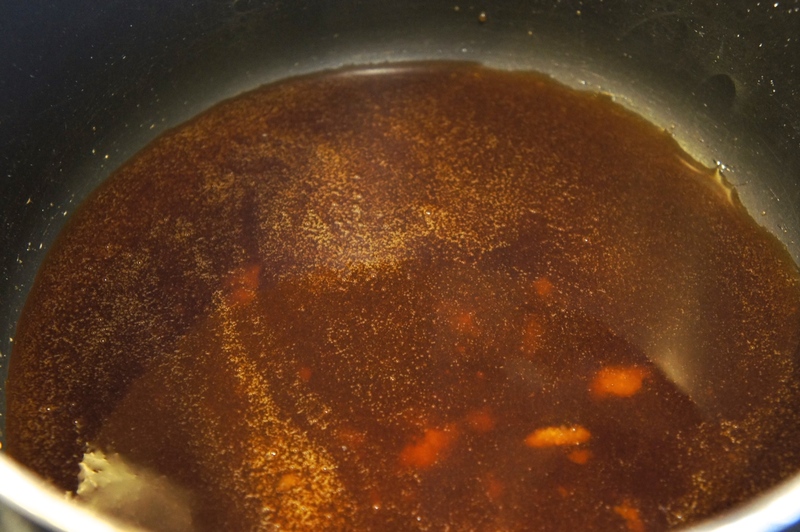 Once it becomes a dark amber hue, remove from heat immediately and stir in butter. If the mixture starts to violently bubble, do not worry this is meant to happen! 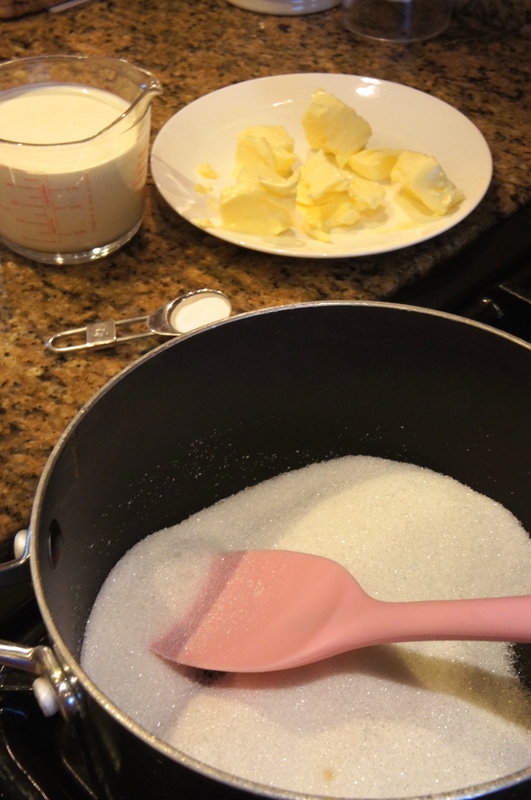 Use your spatula to stir the butter and sugar until they melt together completely. Next, pour in the heavy cream and sea salt. Use your spatula to stir until everything is combined. Place back on the stove for about a minute to remove any lumps of caramel, stir the whole time. Remove from heat, pour into a bowl and put in the fridge to thicken for a least 30 minutes. 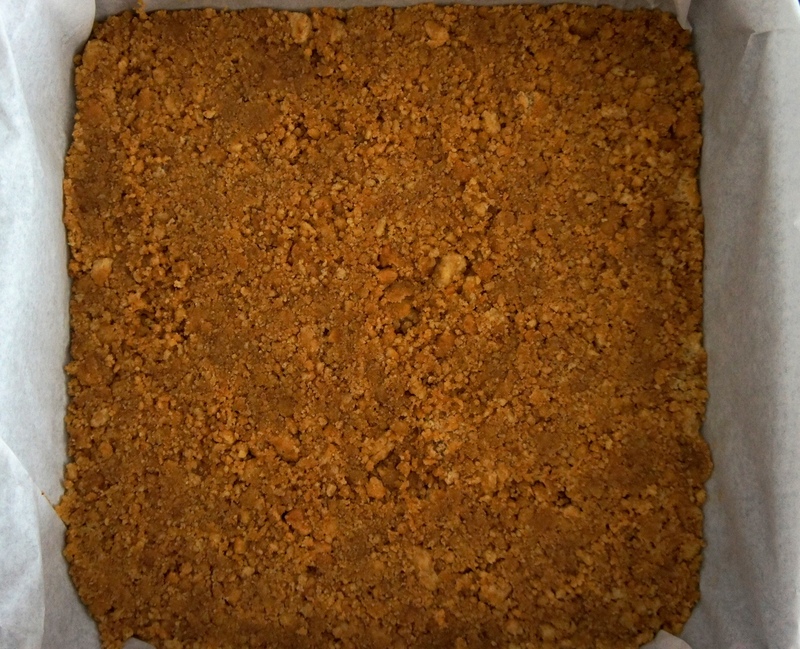 Whislt the caramel is thickening, preheat the oven to 180°C and lightly grease and base line a 23cm square tin. Begin making the brownie mixture by gently melting the butter and chocolate in a bowl over a pan of water at a low heat. Once melted leave on the side to cool. In a separate bowl whisk together the sugar and eggs. Then add in the cooled chocolate and butter mixture, the flour and the chocolate chips and fold everything together until you have a thick chocolate mixture. 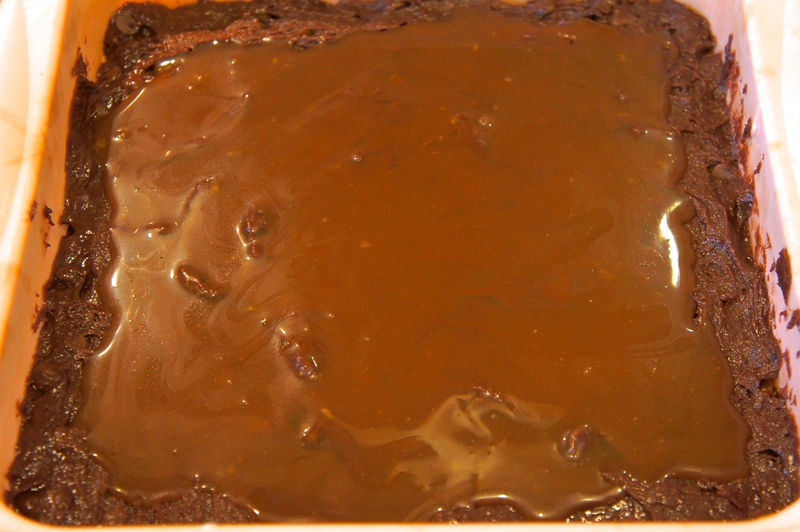 Now pour 1/2 of the brownie mixture into the prepared tin spreading it out evenly and then spoon the salted caramel on top, spreading it out but not quite to the edges (save some caramel to drizzle over later). 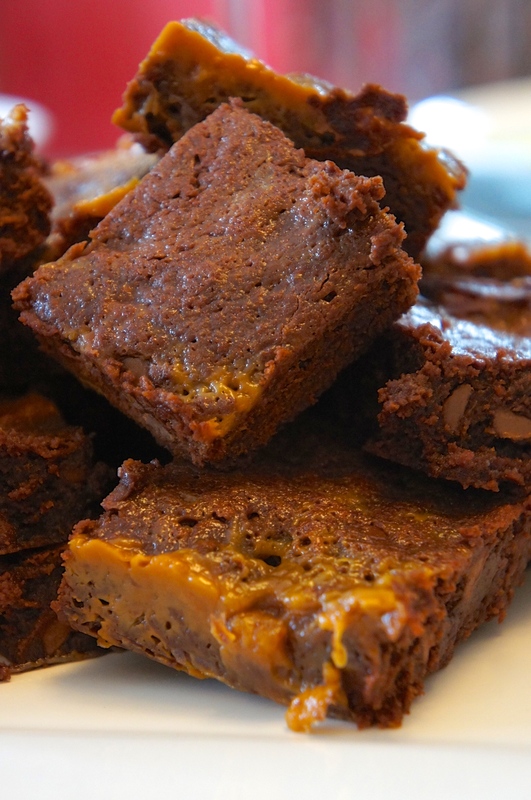 Pour the remaining brownie mixture on top and try to seal as much of the caramel in as you can. 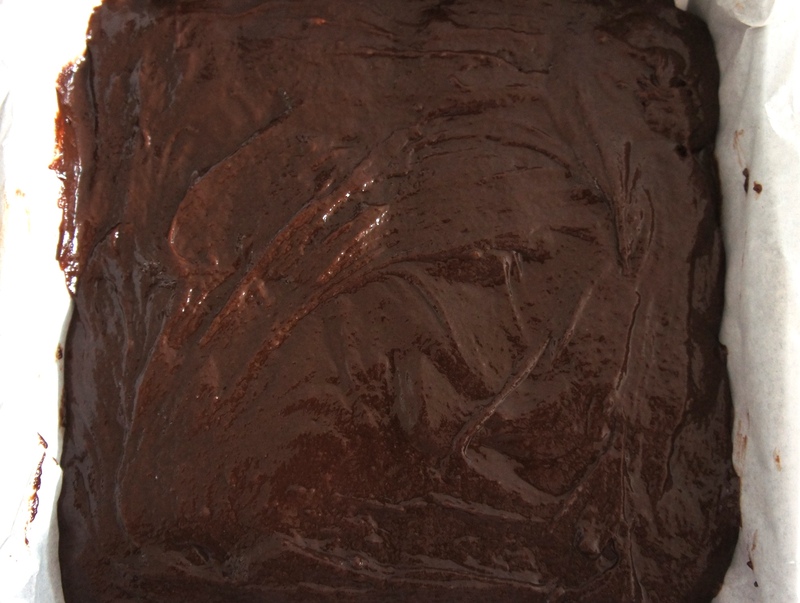 Bake the brownies for 25-30 minutes until the top is starting to crack. Leave to cool completely (I left mine overnight), cut into 12 squares and serve. 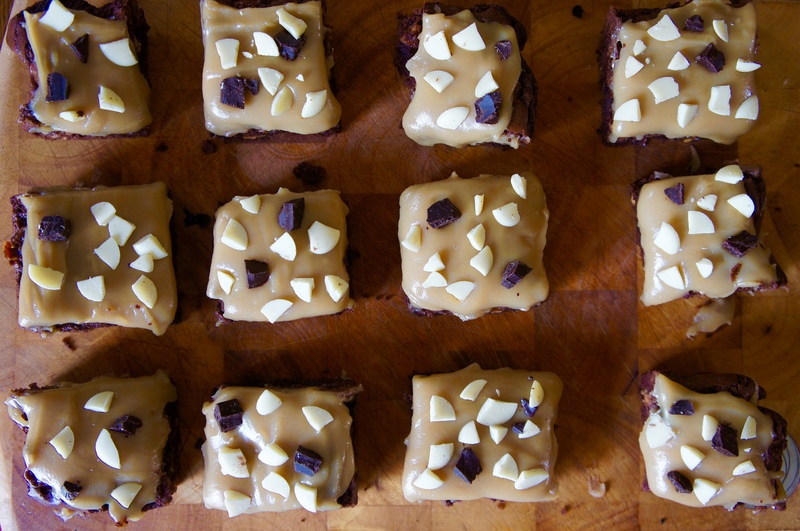 I love these brownies warmed up in the microwave with a dollop of vanilla ice-cream and a drizzle of salted caramel…. absolute heaven! 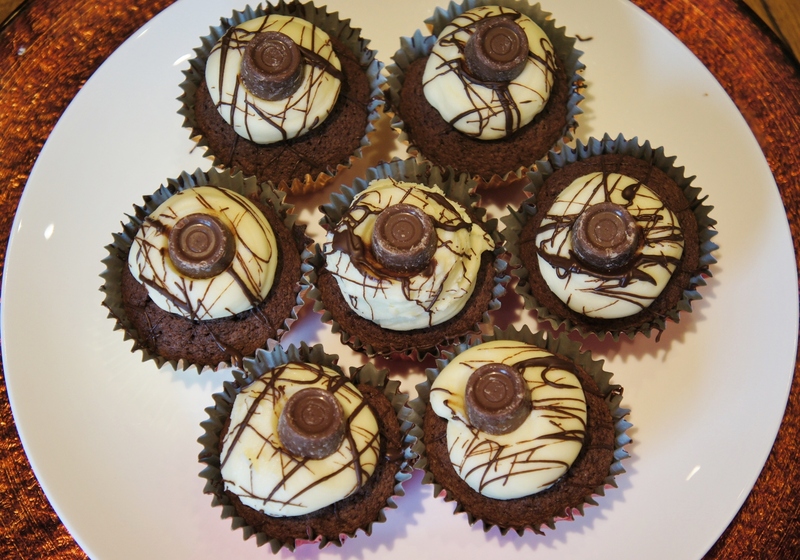 These cupcakes are the ultimate sweet treat! Tuck into a rich dark chocolate sponge with a caramel surprise center, topped with fluffy butter cream, melted dark chocolate and a delicious chocolate caramel. Now doesn’t that sound good!? Please don’t be put off by the amount of steps for this recipe, it is in fact super easy and quick to make. Plus isn’t dark chocolate meant to be healthy? Who am I kidding, but hey.. we all need a little indulgence now and then! Preheat oven to 180°C and line a 12 hole cupcake tray with cases. In a large bowl cream together the butter and sugar until light and fluffy. In a separate bowl combine the flour, cocoa powder and baking powder. Crack one of the eggs into the butter and sugar mixture, add a tbsp of the dry ingredients (flour, cocoa and baking powder) and mix together. Crack in the other eggs and add another tbsp of the dry ingredients and mix together until combined. Melt the dark chocolate in 10 seconds blasts in the microwave. Once fully melted add this to the mixture along with the remaining dry ingredients and fold the mixture together, being careful not to over mix. Half fill each of your cupcake cases and then place a Rolo in the middle of all of the cases. Now cover the Rolo’s with the remaining cake mixture until completely concealed and lightly tap your cupcake tin on the side to remove any air bubbles. Bake in the oven for 13-15 minutes until a toothpick inserted in the middle comes out clean. Remove from the oven and leave to cool. Now make the frosting by creaming the butter until pale in colour and fluffy. Add half the icing sugar in and mix until creamy and combined. Add the remaining icing sugar and vanilla extract and beat together for approx. 5 mins until frosting is soft, smooth and fluffy. 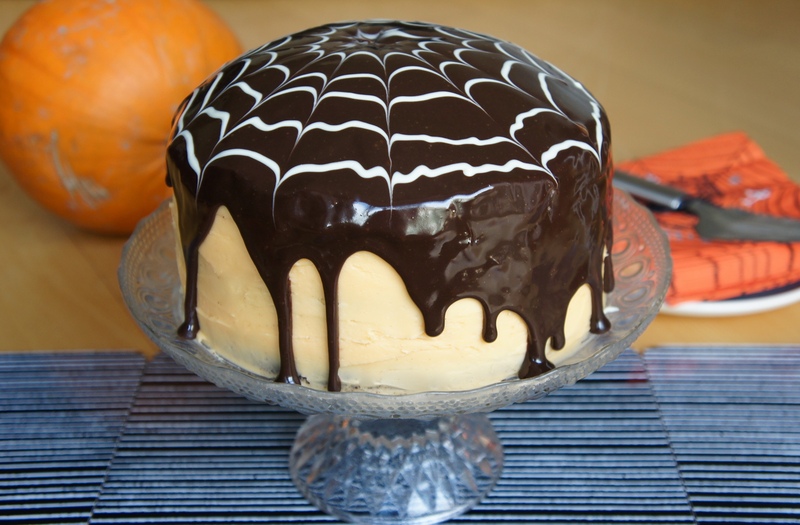 Once your cakes are cooled, either use a piping bag to pipe your frosting onto your cakes or simply spread it on with a spoon. To decorate your cupcakes, melt the dark chocolate in the microwave in 10 second blasts and use a spoon to drizzle the chocolate over in all directions. 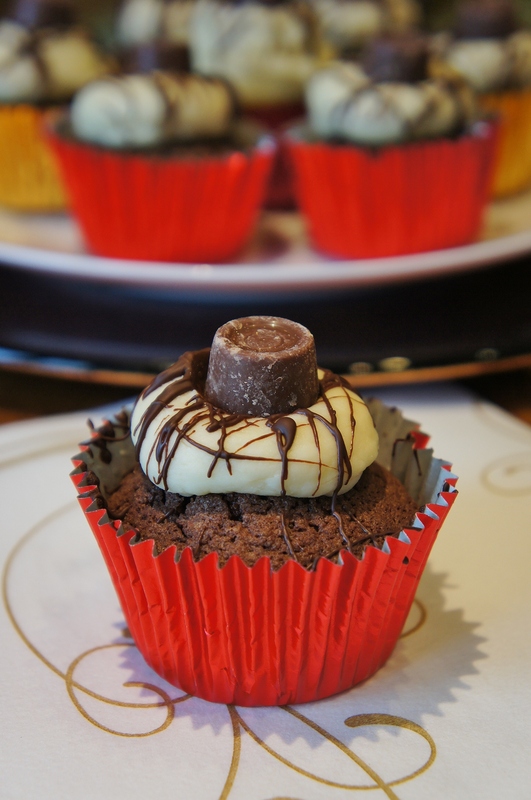 Finally, place a Rolo on top of each cupcake. Enjoy!